Chipping is a skill often used around the green. Of course, you can use this skill under trees, in bunkers or to get out of tricky situations, like in a tree! Chipping is probably one of the easiest skills to learn, and can be adapted to any club in your bag. It is best to practice this initially with a 7 iron as this club has enough loft to see the ball pop up and run. This exercise would be great outdoors if you are able to. However, you can also do this in your home. If you decide to do this in you home, change the golf balls to tennis balls and make sure you have enough room to swing the club without breaking anything. Stand with feet about shoulder width apart. Standing with your feet wider creates the body to rock back and will often result in a poor shot. Place a little more weight on your target side foot. Your target side is the one closest to the target/hole. Hold the club as you would any other time you swing a club. You want your hand hold to be comfortable, with both palms face together as much as possible. Chipping, in essence, is putting with an iron/wood. You will need to adopt the same principles as in putting. 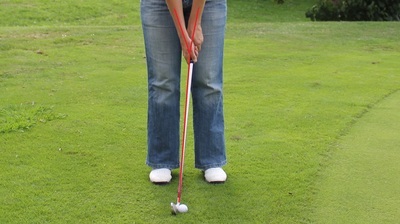 Make sure you maintain the "Y" position at the start, on the back-swing and on the follow-through. 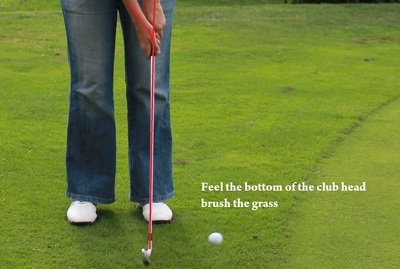 You want to focus on brushing the bottom part of the club over the grass. Imagine yourself sweeping dust off the carpet. It is a good idea to practice just this motion first before placing a ball down. 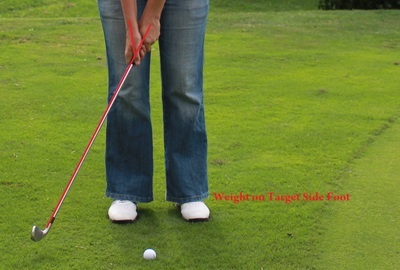 Place a ball roughly in the middle of your stance. With the same method above, "putt" the ball. You will see the ball pop over the fringe (longer grass) and roll on the green. You can adjust the length by the length you take it back. Take the club back longer will result in the ball travelling further. 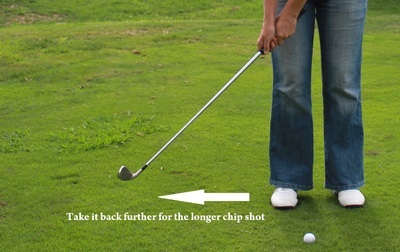 Tack the club back shorter and you will have a shorter shot. TIP: Remember to all the club to pick up a little speed through the ball. Some people stop at the ball, which means you will not have control on how far the ball travels or rolls. Once you have mastered this skill practice going to different holes. Then practice with other clubs. Of course, some clubs will make the ball pop higher than others, however you will soon learn what each club does and how you can use this in your next game. Do you think Great White Sharks should be killed?